#1158 FANTASTIC SCHOOL COMPUTER TRAINING CLASSROOM & OFFICE AUCTION - NAME BRANDS LIKE HAWORTH NOVA SOLUTIONS STEELCASE HON WITH MULTIPLE CHAIRS COMPUTER TRAINING & FOLDING TABLES DA-LITE PROJECTIONS SCREENS PLUS AN ITALIAN LEATHER SOFA! #1158 FANTASTIC SCHOOL COMPUTER TRAINING CLASSROOM & OFFICE AUCTION - NAME BRANDS LIKE HAWORTH NOVA SOLUTIONS STEELCASE HON WITH MULTIPLE CHAIRS COMPUTER TRAINING & FOLDING TABLES DA-LITE PROJECTIONS SCREENS PLUS AN ITALIAN LEATHER SOFA! YOU DO NO WANT TO MISS OUT ON THIS ONE! #1158 FANTASTIC SCHOOL COMPUTER TRAINING CLASSROOM & OFFICE AUCTION - NAME BRANDS LIKE HAWORTH NOVA SOLUTIONS STEELCASE HON WITH MULTIPLE CHAIRS COMPUTER TRAINING & FOLDING TABLES DA-LITE PROJECTIONS SCREENS PLUS AN ITALIAN LEATHER SOFA! YOU DO NO WANT TO MISS OUT ON THIS ONE! SOMETHING FOR EVERYONE! THERE ARE MANY HEAVY AND LARGE ITEMS ON THIS AUCTION - PLEASE BE SURE TO BRING TOOLS, EQUIPMENT AND HELP FOR REMOVAL! REMOVAL IS ON MAIN FLOOR BUT THERE IS NOT A LOADING DOCK SO PLEASE PLAN ACCORDINGLY. BONUS!! TWO DAY PICK UP!! Beautiful Cherry Wood Office Coffee Station Stand - Includes Cups Etc. Great Condition! Black Wood Side Table Plant Stand - Excellent Condition! High Quality KFI Seating Heldon Accent Guest Chair Lobby Seating Ulcon Spice - #1 - Great Condition! High Quality KFI Seating Heldon Accent Guest Chair Lobby Seating Ulcon Spice - #2 - Great Condition! Klaussner International Large Mahagony Mission Arts & Crafts Style Coffee Table With Drawers - Classic Styling With Gorgeous Accents Including the Hardware - Great Condition! 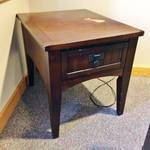 Klaussner International Large Mahagony Mission Arts & Crafts Style End Table With Drawer - Classic Styling With Gorgeous Accents Including the Hardware - Great Condition! Klaussner International Large Mahagony Mission Arts & Crafts Style End Side Table With Drawer - Classic Styling With Gorgeous Accents Including the Hardware - Wear Spot Shown In Picture! Pair Of Office Decor Artificial Plants In Pots - Great Condition! Klaussner International Large Mahagony Mission Arts & Crafts Style Console Sofa Table With Drawers - Classic Styling With Gorgeous Accents Including the Hardware - Great Condition! WOW MSRP $5000 Incanto Group Italian Leather Salerno 3 Seater Sofa - Gorgeous Condition - See Pictures - No Tears!! HON Premium Quality High Back Comfortable Ergonomic Upholstered Executive Chair - Great Condition! Easy Transport Quartet Dry Erase Whiteboard Easel - Great Condition! HIGH QUALITY STEELCASE L Shape Desk Training Workstation Includes 2-2 Drawer Metal Filing Cabinets with Key - Great Condition! Faux Wood Grain Work Table - Some Fraying of Edges - No Chips! HIGH QUALITY STEELCASE L Shape Training Station With Pennisula Table & 2 Drawer Filing Cabinet - Excellent Conditon! Lot of 3 Office Decor Artificial Plants - Great Condition! 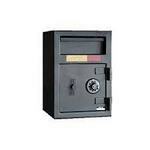 MSRP $550 Amsec DSF2014C B Rate Rotary and Front Loading Depository Safe - Excellent Condition! Contact Manufacturer with the serial number for the combination. MSECS DS SERIES DEPOSITORY SAFES are designed to provide immediate deposits and storage for cash, jewelry and miscellaneous valuables. Deposits can be made through a locked door via a top-loading rotary hopper, a reverse or a front-loading deposit door. Strong, formed B Rate construction made of A36 solid steel plate for improved security and appearance. 1/2" thick A36 solid steel plate, recessed -1/2" to increase resistance to pry attack. Three 1" diameter chromed steel locking bolts. 2014 is available w/reverse hopper. Recessed, heavy duty 3/16" construction (1/4" door). Protected by dual anti-fish baffles. 4 Drawer Metal Lateral Filing Cabinet Black - Great Condition! MSRP $1200 Haworth Look Designed by ROBERT LEONETTI High-Back Executive Office Ergonomic Multi-Adjustable Upholstered Chair - Has Braille On Underside Of Levers - Excellent Condition! Features • Outer Shell: Upholstered • Arm Caps: Soft black vinyl. • Casters: Standard with hard casters; or optional soft casters, see below. • Mechanism: Swivel with synchronized-tilt. • Height Adjustment: Pneumatic • 2″(51mm) Seat depth adjustment. • 3″(76mm) Back height adjustment. • Optional Back-Lock: Lockable in four positions. • Optional forward tilt is 3°. • Tilt tension. • User Instructions: Embossed on stainless steel inserts on levers. Instructions in braille on underside of levers. Solo® cups offer superior rigidity for your cold beverage needs. Solo cups are made with at least 70% renewable resources. HIGH QUALITY STEELCASE 5' Grey Laminate Top Classroom Conference Boardroom Training Folding Table - Excellent Condition - Light Scuffing On Sides - Top Mint! 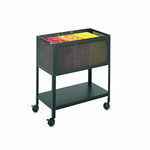 Quartet 3 Shelf Mobile AV Utility Cart - Great Condition! Black Coat Rack Stand - Excellent Condition! QUARTET MODEL 9112 11 INCH PAPER CUTTER TRIMMER ART CRAFTS SCRAPBOOKING - Like New Condition! Please make sure you have help for removal of all large items. Credit Card Payments under $20.00 are accepted but will incur an additional $1.00 fee to cover additional charges through credit card programs. Please call ahead of time if you would like your item shipped to you.